From swine rooting about University Hall to football fashioning the footprint of Brace Labs, the colorful history of early campus architecture will be explored in the next Nebraska Lecture. The talk, “Building Nebraska U: The Saga of University Hall and the Origins of the Modern University,” is 4:30 p.m. Feb. 12 at the Nebraska Champions Club. It will be led by Kay Logan-Peters, professor of libraries and creator of an online tour of the university’s architectural history. “Only three of the buildings within the University of Nebraska’s original four-block campus are still standing,” Logan-Peters said. “My talk will mostly be about that original campus, the first expansion across 12th Street, and how East Campus was established. The event, which is free and open to the public, will include a NET-produced, virtual reality tour around the exterior of University Hall, which was the first building on campus. And, Logan-Peters will be giving away and signing copies of her book, “University of Nebraska–Lincoln,” which features more than 180 historical pictures of the university. Nebraska's first Administration Building opened in 1905. Designed by Thomas Kimball, the building was demolished in 1963. It was located in the sculpture garden southwest of Sheldon Museum of Art. Logan-Peters is based in library within Architecture Hall — the university’s oldest standing building, having opened in 1892 as the campus library. A love for architecture coupled with regular student inquiries about the history of campus buildings led Logan-Peters to gathering information to launch the UNL Historical Buildings website in 2008. "This project started out as a way to tell the story about the university and how it evolved and expanded over time," Logan-Peters said. "The website has become a resource for campus and the public. It's also led to regular referrals and requests for me to lead historical tours." 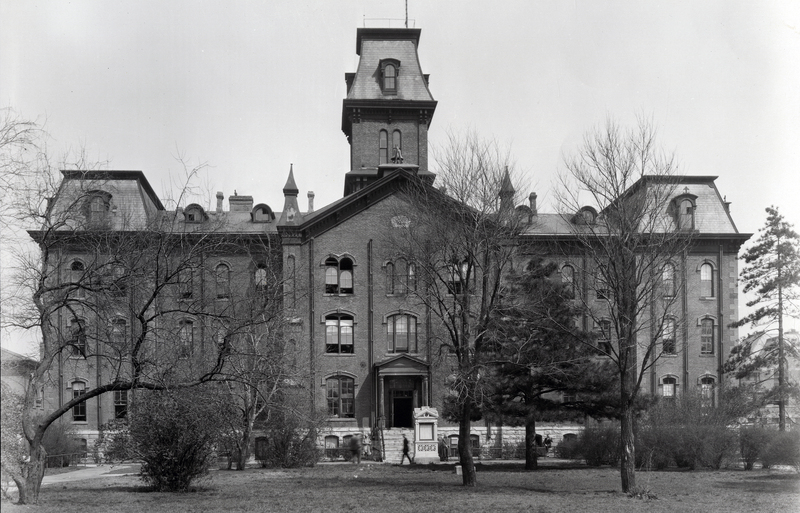 The site documents university buildings on City and East campuses from 1869 to 1965, including details about architectural styles and the people who influenced construction. "It's not just about the architectural style of each building," Logan-Peters said. "Every building and portion of campus has a story behind it. And, the details in those stories, from how the property was acquired to how buildings are named, are fascinating." An update to the website, launching later this year, will expand the listing to all campus buildings up to 1990. 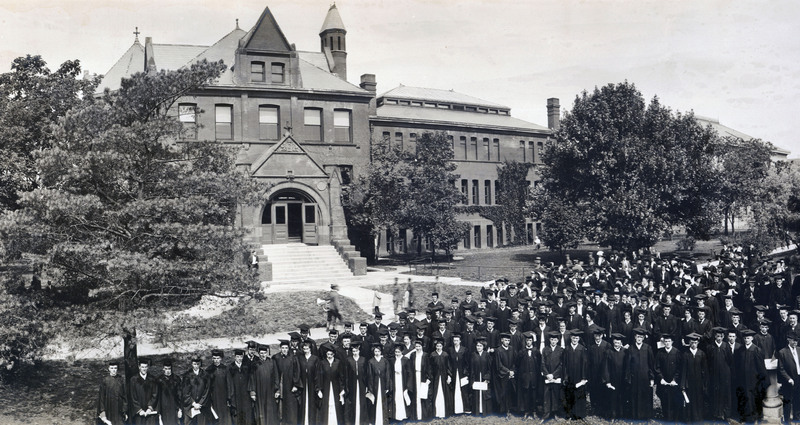 Architecture Hall, shown here in an undated photo featuring graduates, is among the three original buildings still standing in NU's first four block plot. The other two buildings (not shown) are Brace Labs and Richards Hall. Logan-Peters’ talk, which is part of Nebraska’s Charter Week celebration, is the second in the Nebraska Lectures: Chancellor’s Distinguished Speaker Series. Regularly offered twice a year and featuring faculty discussing research and creative activity, the series has expanded in 2019 to a year-long, 12-talk format celebrating the university’s 150th anniversary. The expanded series is supported through a $15,000 grant awarded by the National Endowment for the Humanities through Humanities Nebraska. The 2019 Nebraska Lectures opened Jan. 23 with Charlyne Berens, professor emeritus and former associate dean of the College of Journalism and Mass Communications, discussing the history of the state’s unicameral legislative body. The talk is now available online as a podcast and video. Additional lecture topics and dates will be announced. 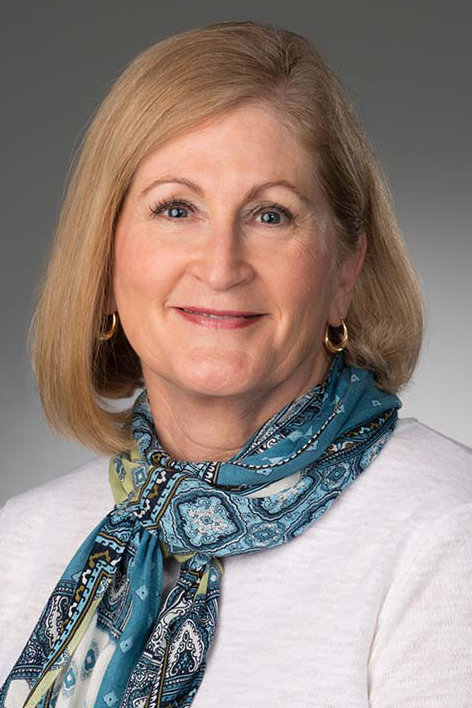 The Nebraska Lecture series is sponsored by the Research Council, Office of the Chancellor, Office of Research and Economic Development, Osher Lifelong Learning Institute and Humanities Nebraska.